AMD’s Ryzen architecture has delivered some much-needed competition to the market and unlike their previous architecture, we are seeing viable ITX platforms for the AM4 chipset. 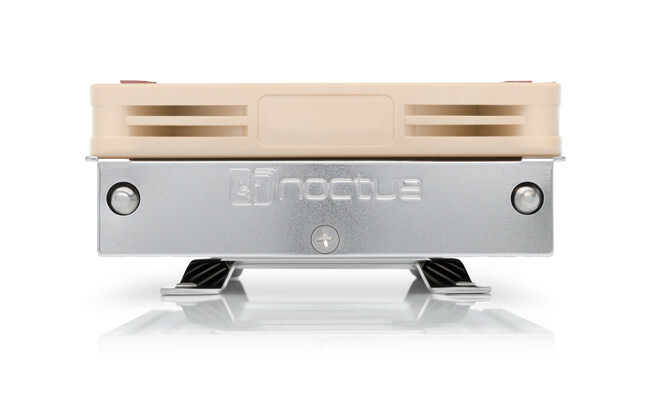 Small form factor motherboards often need low-profile coolers and the Noctua L9a-AM4 is as low profile as you can get. 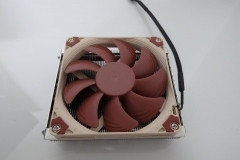 I reviewed the older Noctua L9i Intel 115x socket cooler in 2013 and was surprised by the performance and low noise profile given the diminutive size of it. We currently use two NH-L9i coolers in our more portable ITX Fractal Design Node 202 systems and have never had an issue with keeping our Intel CPUs cool. 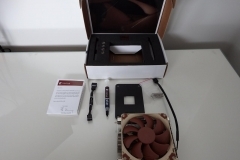 The new Noctua L9a-AM4 is the Ryzen variant and based on its lineage we had high expectations. What is the NH-L9a-AM4 and why would someone want one? 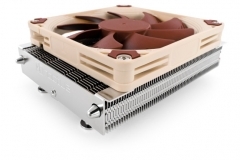 As the name suggests, this is a Low-profile 92mm AM4 socket cooler. 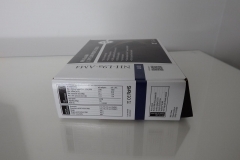 With a total height of 37mm, this is as low a profile that you will find on a cooler and it is a niche product for system builders with a specific need. 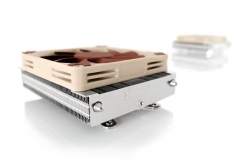 The 37mm height is made up of a 23mm thick heat sink and a 14mm thick fan – a standard fan is 25mm thick so Noctua has managed to shave off 11mm here by fitting a faster, slimmer PWM fan. There are other low profile coolers available but the N9a-AM4 is at the extreme end of the scale for a compact unit and would be suitable for HTPC or small form factor builds where taller coolers just won’t fit – a good example is the Fractal Design Node 202 ITX case. 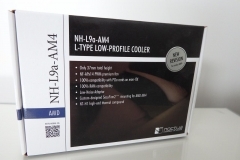 Some low profile coolers will use a flat fin stack that extends over the memory slots and can make accessing some fan headers difficult – not the L9a-AM4. This cooler has a 114mm x 92mm footprint – that isn’t really so large when you look at the AM4 socket/mounting layout – allowing unobstructed access to fan headers, memory modules, the first PCIe slot and doesn’t get in the way of the 8-pin CPU power connector. The socket clearance is the best you will see and although similar in footprint to a water cooler CPU block, there are no hoses to deal with. 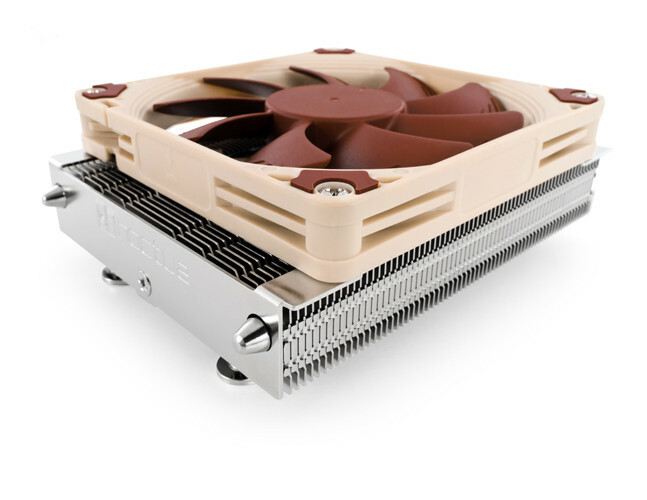 If you’re building a compact system with a CPU/APU that matches the Noctua TDP guidelines the L9a-AM4 could be just what you need. This limitation is perfectly reasonable and is one of the reasons why Noctua has the NH-L12S available. The L12S will be reviewed in the near future but it provides a superior cooling solution at the expense of some height when compared to the L9a-AM4. 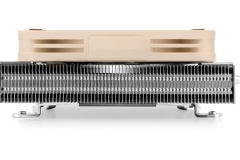 As with any low-profile cooler, case airflow is very important – meaning that you will need to keep cables neat and fans tuned to provide constant airflow to feed the CPU cooler and exhaust warm air. Despite our Ryzen 7 1700 CPU meeting the TDP guidelines in terms of it being well under 95W, it is listed as ‘incompatible’. That said, we tested this configuration anyway and found that the NH-L9a-AM4 was able to keep the 1700 under 65°C with sustained OCCT workloads. 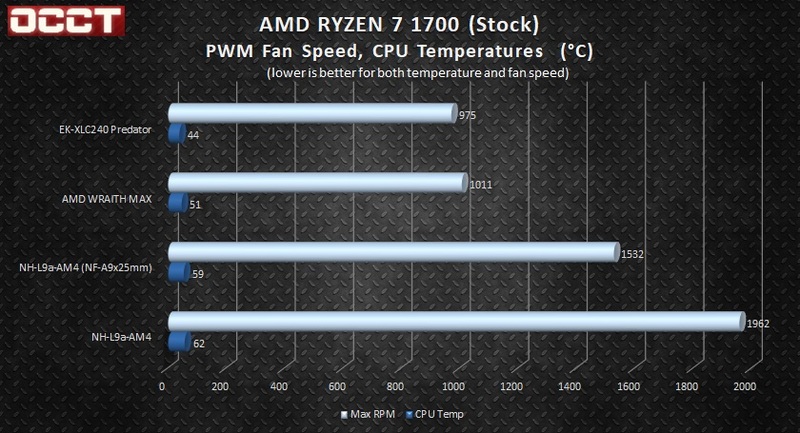 Typical workloads, gaming and multi-tasking didn’t see the CPU go over 60°C for more than a few seconds at a time. After a month of using the L9a-AM4 in place of our previous cooler without an overclock in effect, I’m happy to report that we didn’t have any thermal issues whatsoever – despite some quite warm days in the office where the room temperature spiked just shy of 30 degrees. 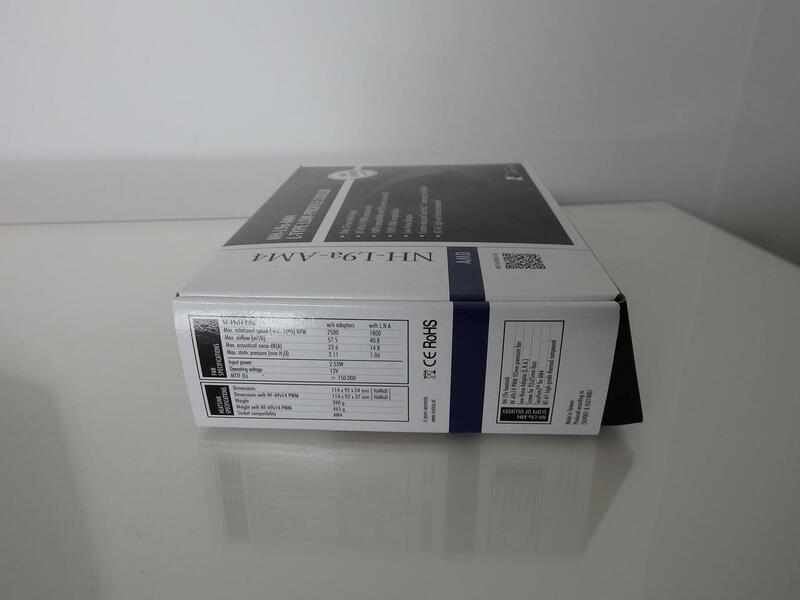 As usual, the review unit was in pristine condition and an example of perfect manufacturing. 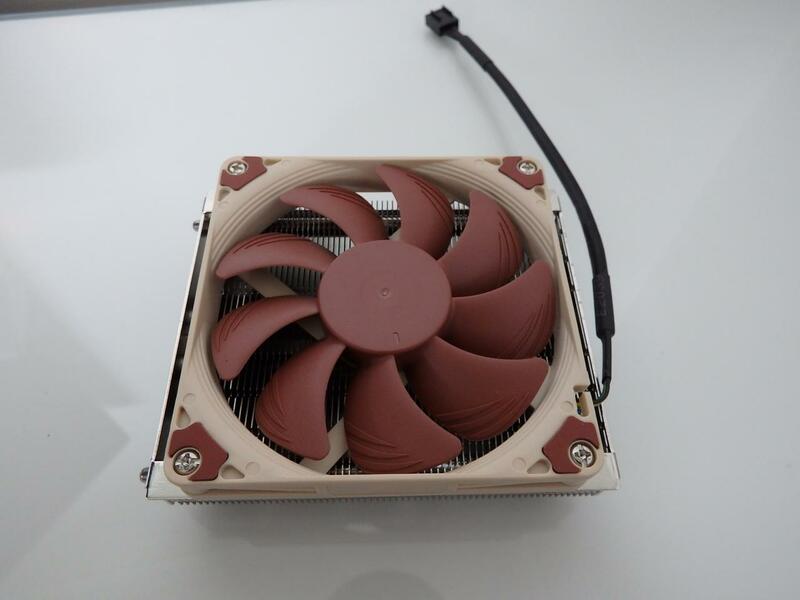 The design is simple and the quality control for Noctua is the best we have seen from any vendor. 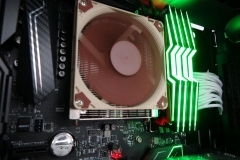 Mounting the L9a-AM4 is straightforward but different from the usual Noctua SecuFirm2 process in that the heat sink attaches to the motherboard without a bracket in between. There is a back-plate and 4 thumbscrews that all lined up perfectly. Whilst it is possible to mount this cooler into a ready-made system, already installed in a case, I’d highly recommend mounting it to the motherboard prior to the board being installed into a case as it is much easier to line up the screws. The cooler mounting process took about 3 minutes from the time I applied the NT-H1 thermal compound to the time I’d connected the 4-pin PWM fan header. 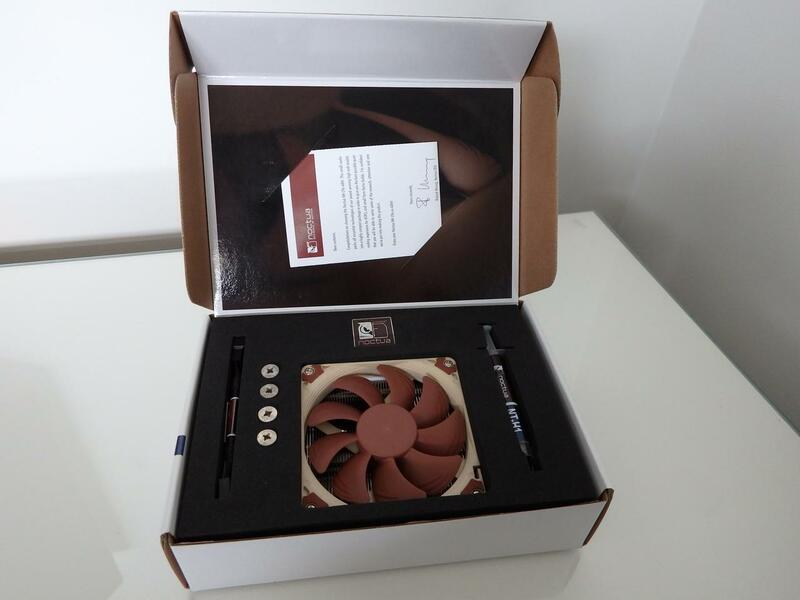 The packing is consistent with every other Noctua product we’ve seen in that it’s neat, well protected and has everything you need – including longer fan bolts in case you want to use a 25mm thick Noctua NF-A9 fan. Specifications of the coolers can be found below. We used OCCT to run a 45-minute test with 5-minute idle periods either side. The test system was left in an idle state for 30 mins prior to the testing for each run at the applicable fan speed (12v or PWM curve). Temperature monitoring was done with HW Monitor V1.34. 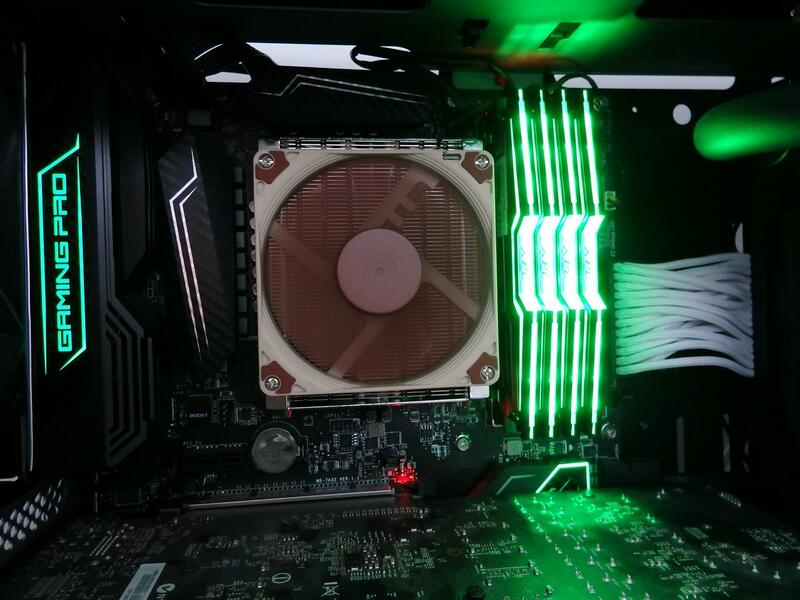 When testing any CPU cooler at 12V, it tells us what the cooler is thermally capable of – even if the noise profile is too loud. This test also helps us to identify a bad mounting with the CPU. Keep in mind that the temperatures were taken in a room with an ambient temperature of 22°C as per the reading in HWMonitor v1.34. 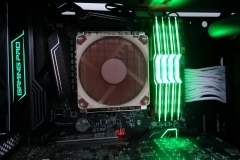 The comparison to the beastly 240mm radiator cooled EK XLC-240 Predator water cooler and larger AMD Wraith Max RGB air cooler are not intended to be fair in terms of performance but they do provide some context for comparison. Neither comparison cooler would fit in a slimline ITX case and both the water cooler and the Wraith Max have significantly more surface area. The goal here isn’t to keep up with the larger coolers, it’s to keep the CPU under 65°C in a 22°C thermally controlled room. As expected, the water cooler aces the test but it also remains clearly audible over other fans in a demonstration of massive overkill. The Wraith Max makes more noise again but delivers solid cooling performance. Surprisingly, the NH-L9a-AM4 is audible but not as loud as the other coolers despite the NF-A9x14mm fan running at almost 2,000RPM. The thermal performance keeps the CPU under the point of thermal throttling with the most compact physical footprint of any AM3 or AM4 cooler we have ever seen. When we swapped to the standard 25mm thick NF-A9 fan, we saw a drop of 1°C that could also have been margin for error. 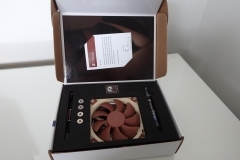 The key difference between the alternate Noctua fan is that the NF-A9 has a maximum speed of 1,500RPM and makes a little less noise – but not enough in our mind to justify the extra cost of the fan as an upgrade. The smaller NF-A9x14 included with the NH-L9a-AM4 isn’t much of a thermal or acoustic sacrifice. 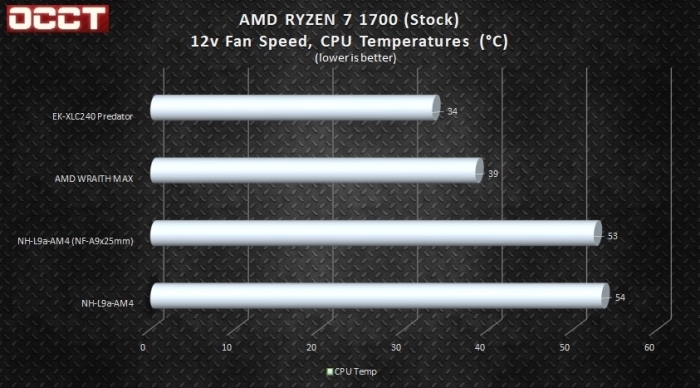 The 12V test demonstrates that the heatsink can dissipate the heat from a stock Ryzen 7 1700 with enough airflow. The next question is one of how well does the heatsink/fan package work when controlled via the motherboard PWM fan curve? 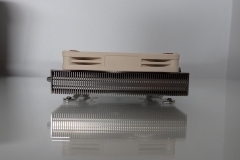 The PWM fan speed testing uses the standard curve across all coolers. 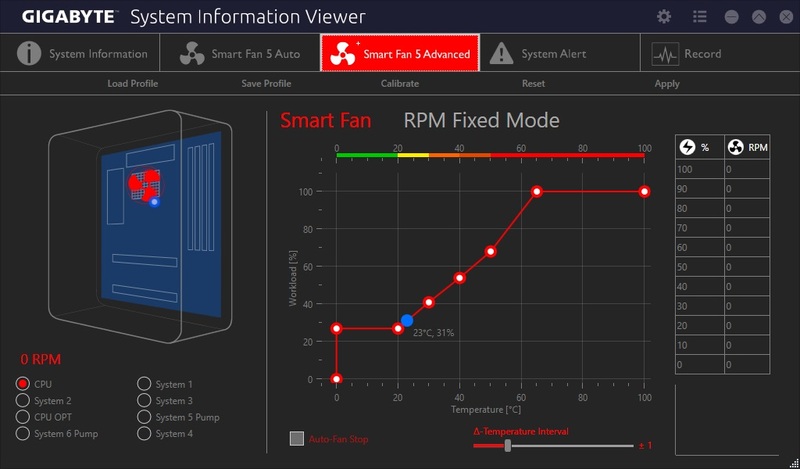 The intention of this testing is to determine how hard each cooler has to work (RPM) to maintain the target thermal curve while under sustained load. 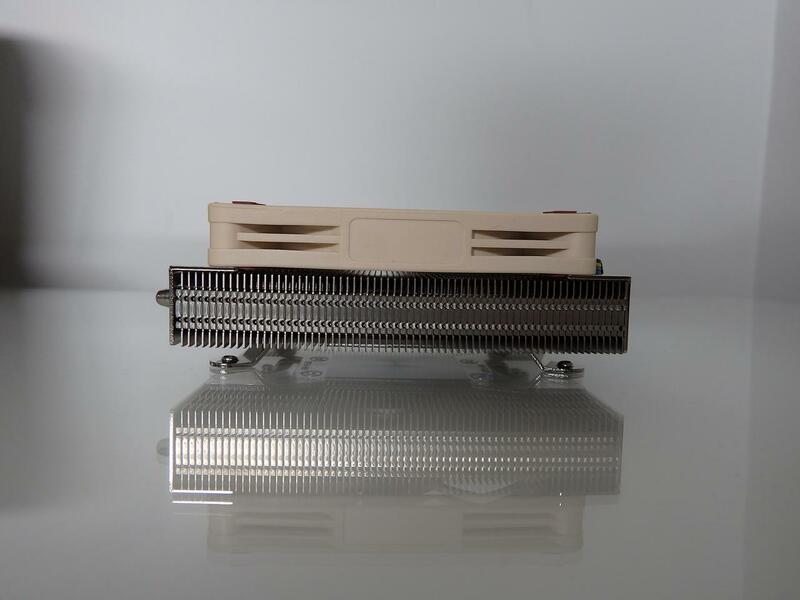 12V operation is preventative in that it applies the best possible thermal dissipation constantly by running the fan at full speed all the time with an acoustic penalty. PWM operation is reactive in that the fan speed adjusts depending on the CPU temperature as influenced by the CPU workload. An example of a PWM curve is below. The chart below shows the CPU load temperature under stock CPU settings in blue and the maximum(peak) fan speed of the cooler in lighter blue. Regardless of the fan we had attached to the NH-L9a-AM4, they both hit their maximum speed during the PWM test. This isn’t a big deal though with the Noctua fans as they don’t make as much noise as a typical fan of that size from another manufacturer. The optional NF-A9 is barely audible at 1,500RPM barely registering on our decibel meter at 40cm above ambient room noise. The included NF-A9x14 fan was slightly louder and registered 26dB(A) on our decibel meter from 40cm with the case side panel open. 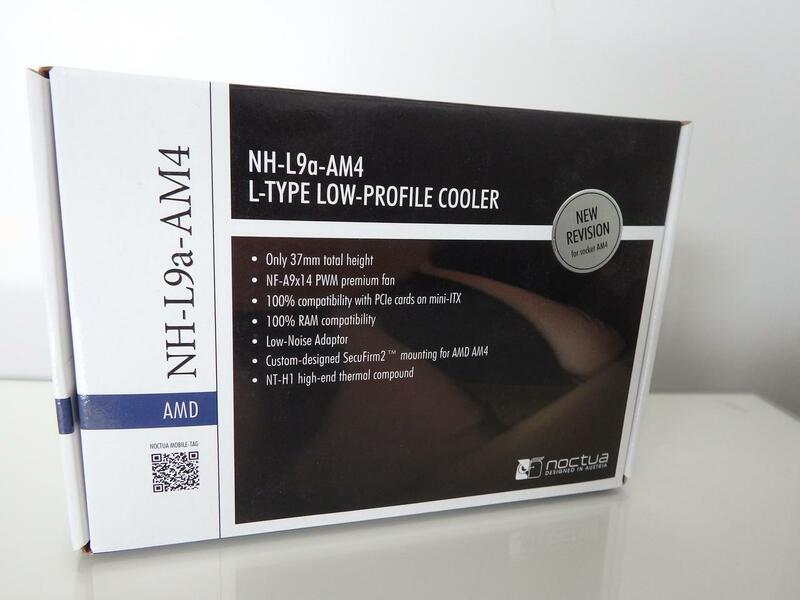 In terms of a thermal comparison, the NH-L9a-AM4 as it comes out of the box was only 11°C warmer than the larger AMD Wraith Max cooler despite having a significantly smaller vertical footprint. 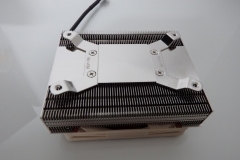 This is what we wanted to see for a super-low-profile cooler, making it perfect for use in slimline ITX cases, as an HTPC or other small form factor build where cooler height is a concern. It is also worth noting that typical load is significantly less than an OCCT test run and we found that the NH-L9a-AM4 would run at much lower speeds most of the time but this will vary depending on the case, airflow and ambient room temperature. 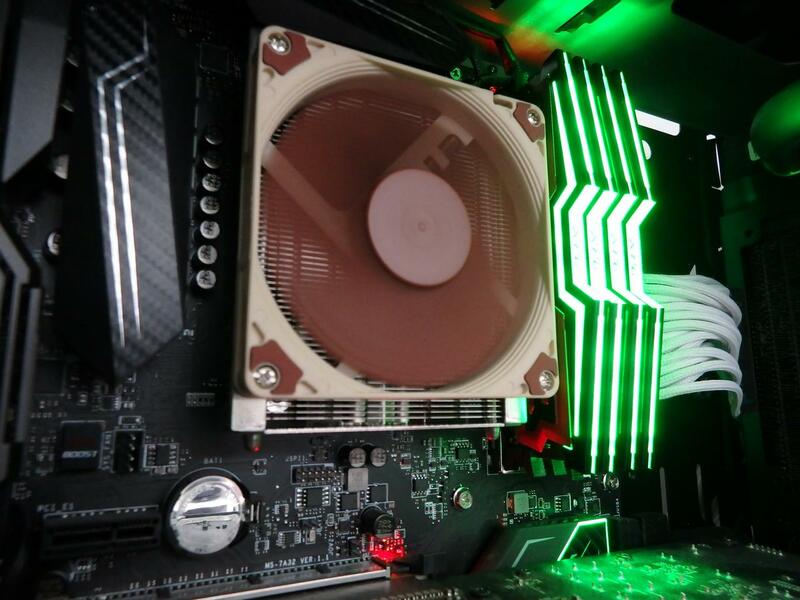 In an ITX build, constant clear airflow is very important – especially if you also game on it or transcode whatever you are watching in real-time. 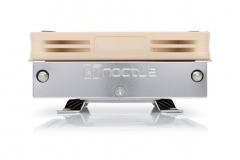 The street price for a Noctua NH-L9a-AM4 is $59. This is good value for a niche product that delivers adequate cooling within the constraints of a compact 37mm tall package. 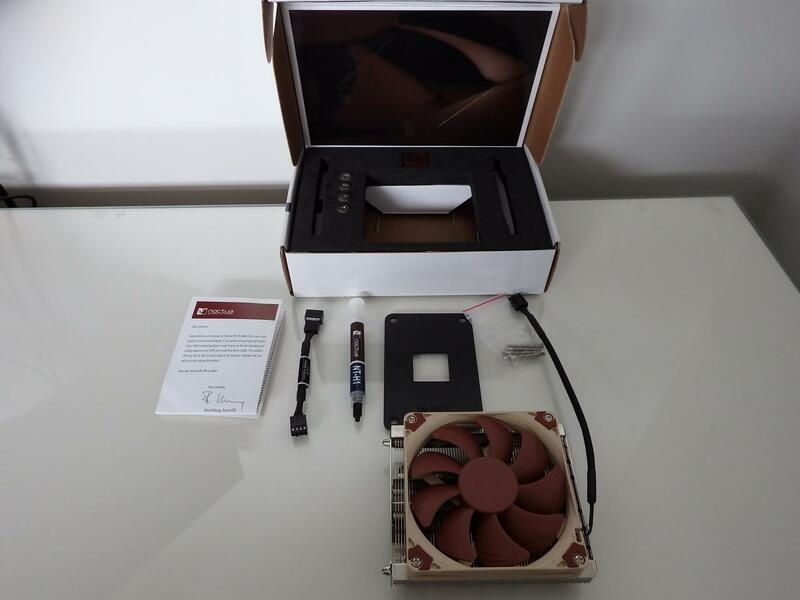 The cooler comes with everything you need including quality non-conductive thermal compound, extra screws for a thicker fan and has a simple, ‘fool-proof’ mounting system. If you’re building an AMD Ryzen 3 or Ryzen 5 rig in a slimline case, the NH-L9a-AM4 is worth the street price – perhaps even a bargain. Buyer’s remorse won’t be an issue here. It’s easy to compare coolers based on their thermal performance alone but low profile coolers like the L9a (AMD) and L9i (Intel) from Noctua are designed to address the space constraint as the priority. 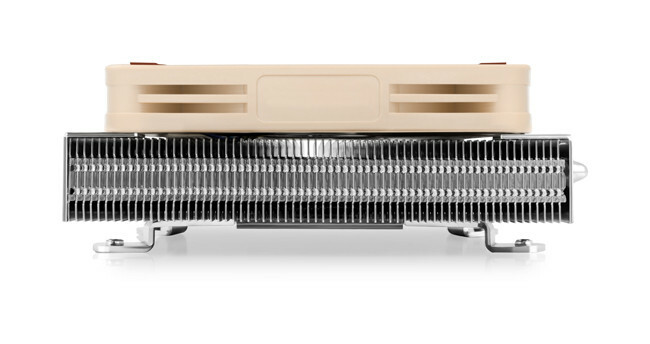 The design team at Noctua met the brief with the NH-L9i years ago and has again delivered with the NH-L9a-AM4 for Ryzen processors. There is always a compromise when miniaturising a build to ITX, we compromise on PCIe slots, hard drive bays, an optical drive and perhaps limit our graphics card choices. 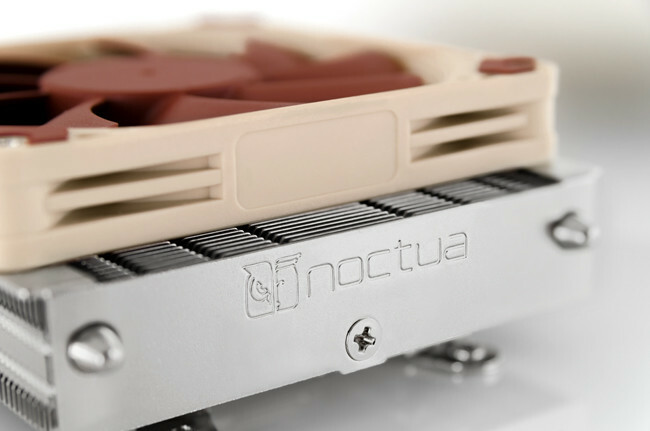 The CPU cooler is no different – luckily for us, Noctua has reduced the acoustic and thermal cost of selecting an air cooler not much bigger than a high-end water block. For those who need the lowest profile Ryzen cooler they can get and don’t want something that screams like a banshee, just buy this.